I swear, if Blizzard keeps putting out news I want to write about, I might just end up a card slinger. I see what you're up to, Blizzard. Not only do we get a good run down of information regarding wings in the upcoming Naxxramas Adventure, but we also received some clarification on how gold cards can be obtained once the Adventure is available. First up, lets talk Naxx. Players will not be able to have access to all of the content at the start. Not only is this content gated, but only the first wing is available for free. Additional wings, as they're opened up in the game, will need to be bought – either through gold or real money – in order to be accessed. While it sounds crazy at first, it's actually rather genius. Each wing unlock only costs seven bucks or 700 gold. There are also bundle pricing for additional wings, which seems to only be available for real cash offerings. The first month that the Curse of Naxxramas is live, the first wing will be open to players. After that, it will cost the same as the other wings. Now, why would I call this pricing scheme genius? Here's why. Reading other players' comments, they're actually pretty excited for this. It's quite possible to work up the gold, if it isn't already in your coin purse, to buy these wings. This means that $25 you were considering slapping down on the 5-wing bundle can be spent on other items you'd want in-game. However, if you're not one to rationalize extra in-game purchases like that, you won't be one to fall into this trap. Another reason why I see this as genius, is that someone like me, who wants to experience the content based on nostalgia likely will not be someone to consume the content quickly. I also have a twisted, masochistic enjoyment of farming. As each new wing is available over time, players could potentially already have the gold needed to purchase it. 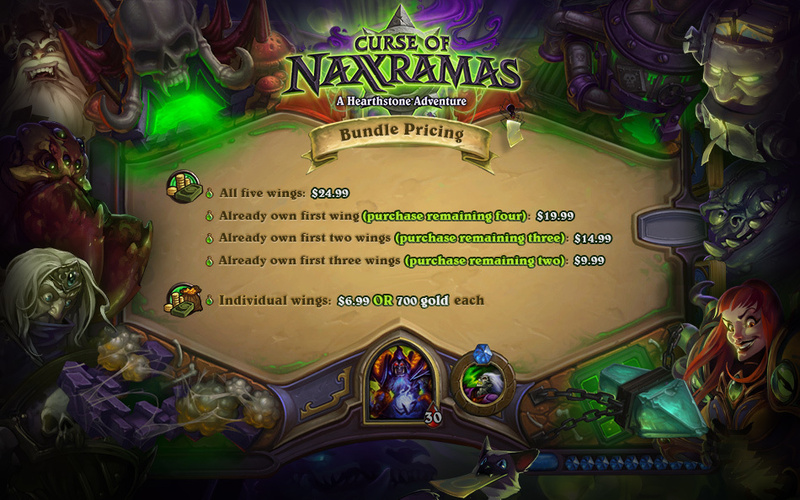 Since I'll likely be terrible at Hearthstone by the time Naxxramas is out, buying all wings at once for cash won't be a smart idea. Throwing myself, head first, at the proverbial wall until it breaks down only to purchase a new wall with the game's currency will let me consume (and pay for, even if I'm using gold) on my own terms. To me, this really is genius. And remember, if you start playing when Naxx is available, that first wing is free to keep! After Naxxramas is live, first the Arachnid Quarter will be available for players. Each week after, a new wing will be available for purchasing in the following order: Plague Quarter, Military Quarter, Construct Quarter, and finally, Frostwyrm Lair. After you've successfully defeated a wing's bosses, you also now have access to that wing's Heroic mode. Defeating the harder version of these bosses will grant you a new card. Speaking of new cards, there's been a little bit of confusion regarding how gold cards will be obtained for the Curse of Naxxramas. Because they were available as drops after defeating Heroic bosses internally, it was thought that the cards would be available this way for players. Even through internal testing, these cards were also available through crafting. Having them available through drops received a lot of negative feedback, and when Naxx is in game, they will only be available through crafting to make these gold cards more accessible to a wider range of the playerbase, as Zeriyah responded on the official forums.